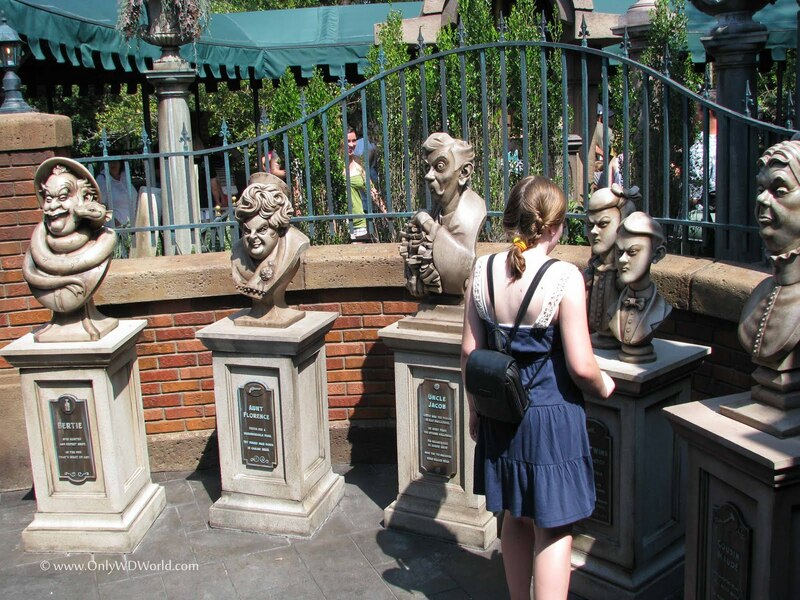 The new interactive queue at the Haunted Mansion in the Magic Kingdom is a lot of fun and gives Disney World Guests a new way to spend their time in line. 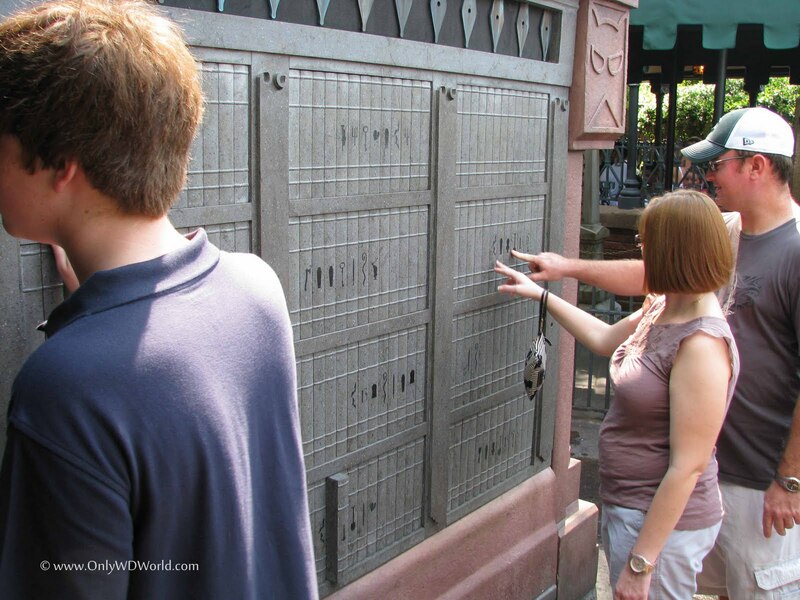 In continuing with the trend of adding interactive activities for Disney World Guests to occupy their time while waiting in line, the Haunted Mansion at the Magic Kingdom is the latest to "plus" its queue. 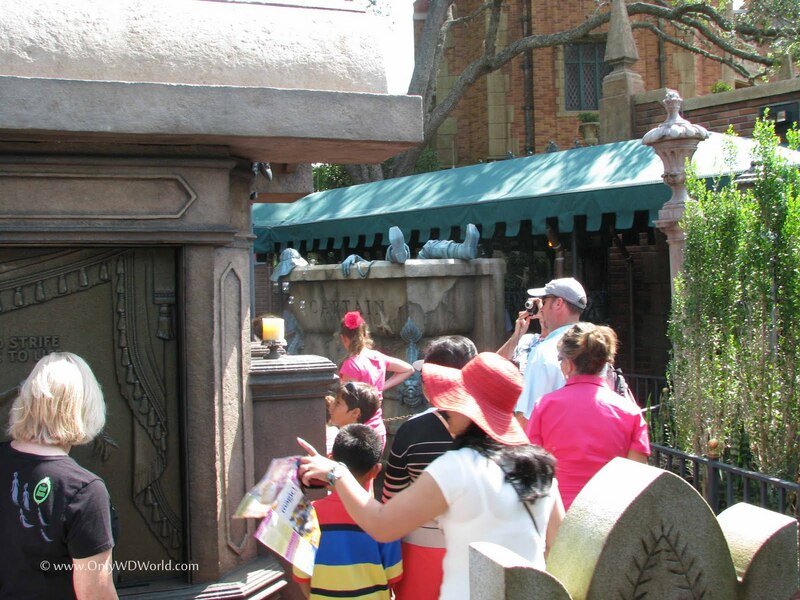 Guests are given the option to explore the interactive portion of the queue or to bypass it and proceed directly to the Haunted Mansion. Taking the path to the new queue extends your wait by a couple of minutes, but it takes that long to play with the interactive features so you don't notice the extra time. 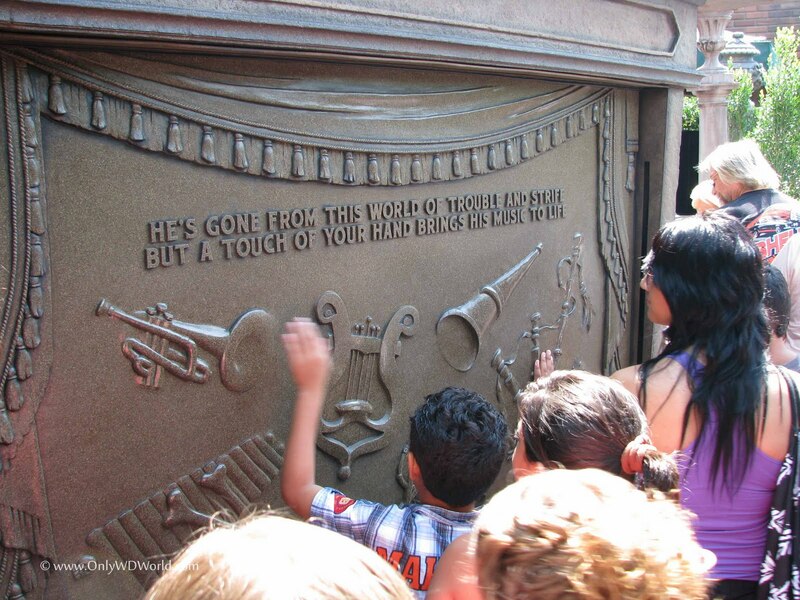 If you touch the musical instruments pictured above it adds those instruments to the music that is playing. 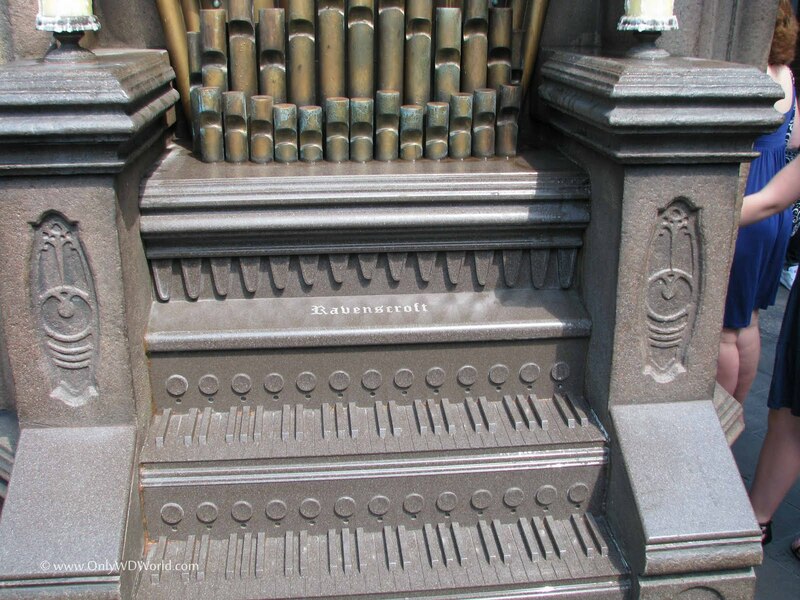 The organ is emblazoned with the name "Ravencroft" in a tribute to "Thurl Ravencroft" had added his voice to a number of projects and is most recognizable as the voice of Tony the Tiger (Kellogg's), singer of "You're A Mean One, Mr. Grinch", and lead singer of "Grim Grinning Ghosts" at the Haunted Mansion. He also lent his voice to a number of characters at Disney World. 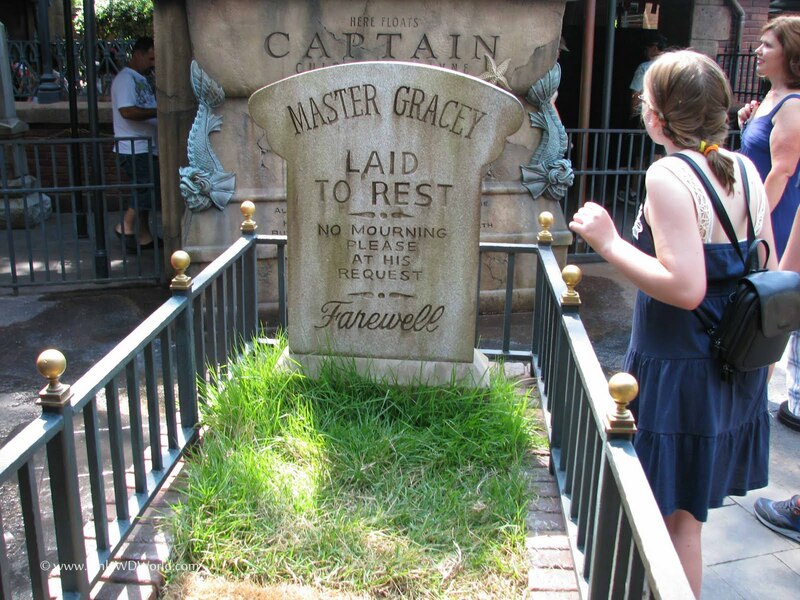 There was concern that the original tombstones that Magic Kingdom Guests have enjoyed reading would be removed to make room for the new queue, but rest assured that the tombstones do have a place in the new queue, like the one for Master Gracey shown above. It is also a tribute to Disney Imagineer Yale Gracey. Yale created many of the classic illusions that you enjoy in the Haunted Mansion. The giant bathtub pictured above periodically spews forth a stream of bubbles to entertain the passersby. 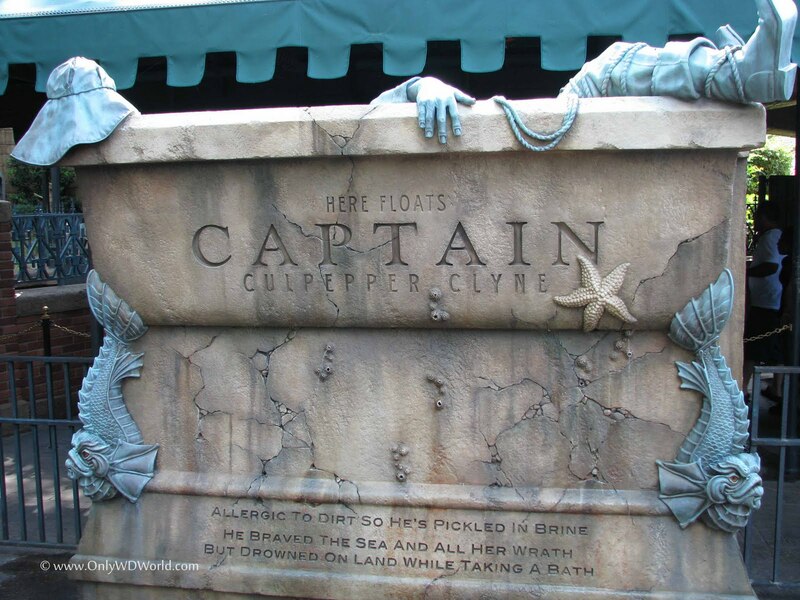 Captain Culpepper Clyne is a character who's picture has been inside the Haunted Mansion since its inception. The bookshelves move books in a out as you touch them. 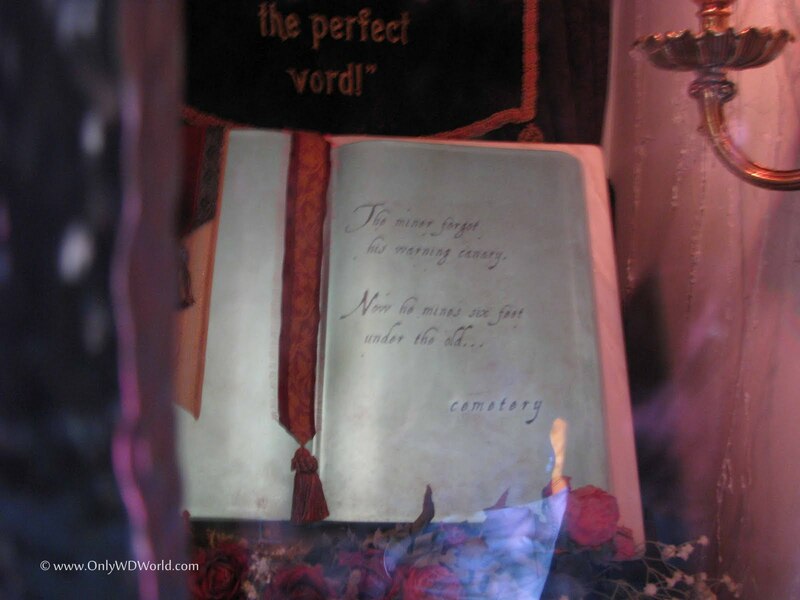 There is also a magic book where the words appear before your eyes. If you compare the two above pictures you will see that the word "cemetery" has appeared. It is even more fun in person because the words appear as if they are being written one letter at a time. 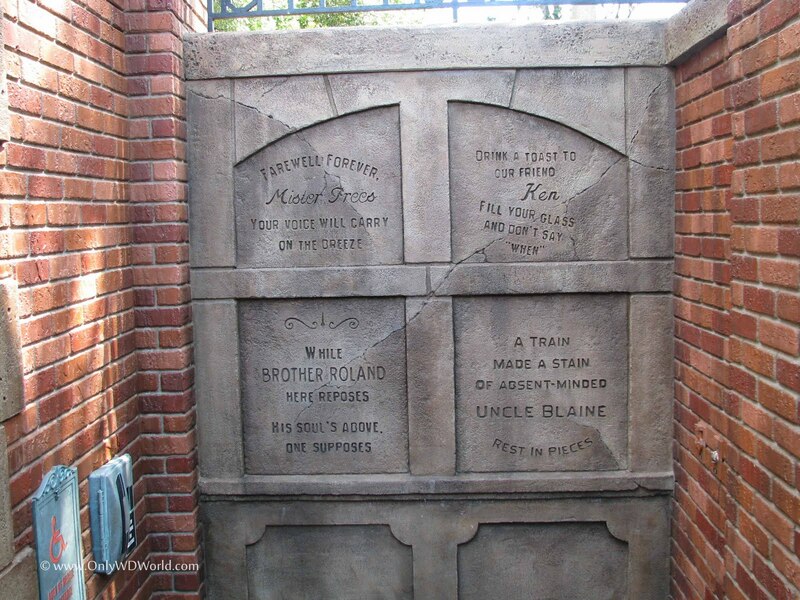 Another wall of epitaphs uses humorous quips that also pay tribute to Disney Legends and Imagineers. 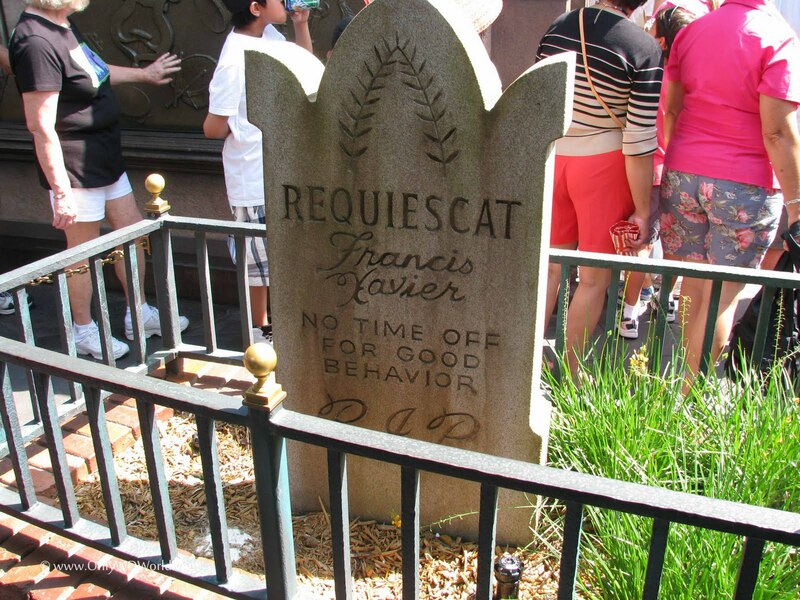 The above tombstone pays tribute to Marc Davis who is responsible for designing many of the humorous gags found in the Haunted Mansion. X. Atencio, referenced above, penned many of the catchy songs for the Disney World attractions including: "Grim, Grinning Ghosts" & "Yo Ho (A Pirate's Life For Me.)" This epitaph reads "Here lies Prudence Pock. She died, it's said from writer's block." 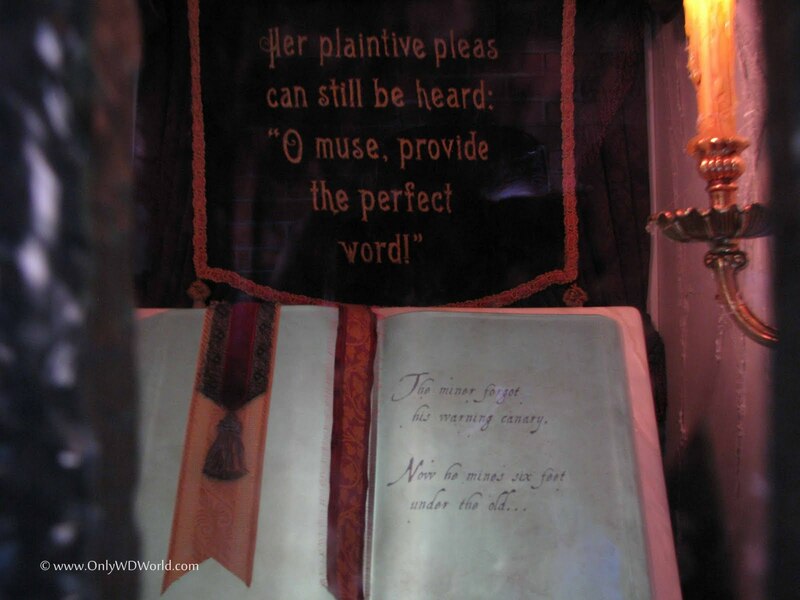 Prudence supposedly was a poetess and may be related to Phineas Pock who is a character in the Haunted Mansion. 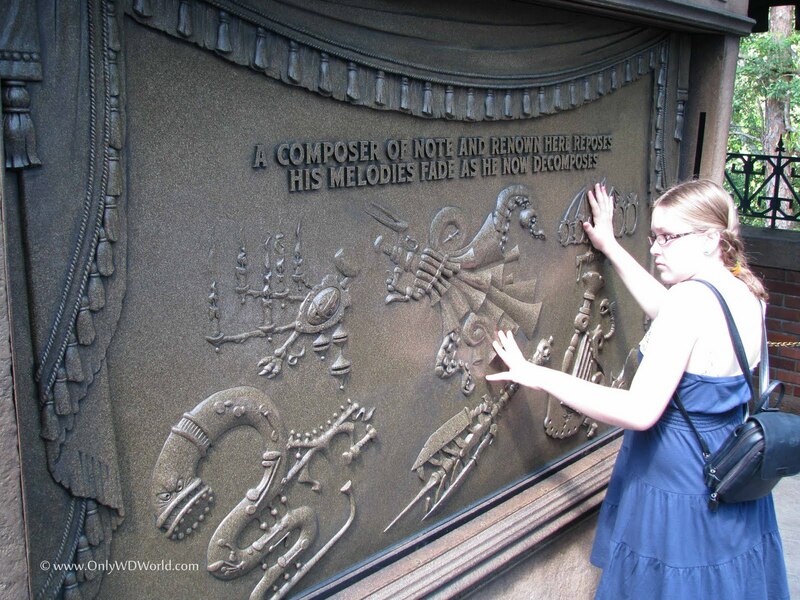 The addition of the interactive queue to the Haunted Mansion was very enjoyable. The added features all fit within the playful boundaries of the existing gags and features of the Haunted Mansion. The guests in line were enjoying playing with the various items. Time will tell if people continue to go through the interactive portion of the line even after they have been through it a couple of times. 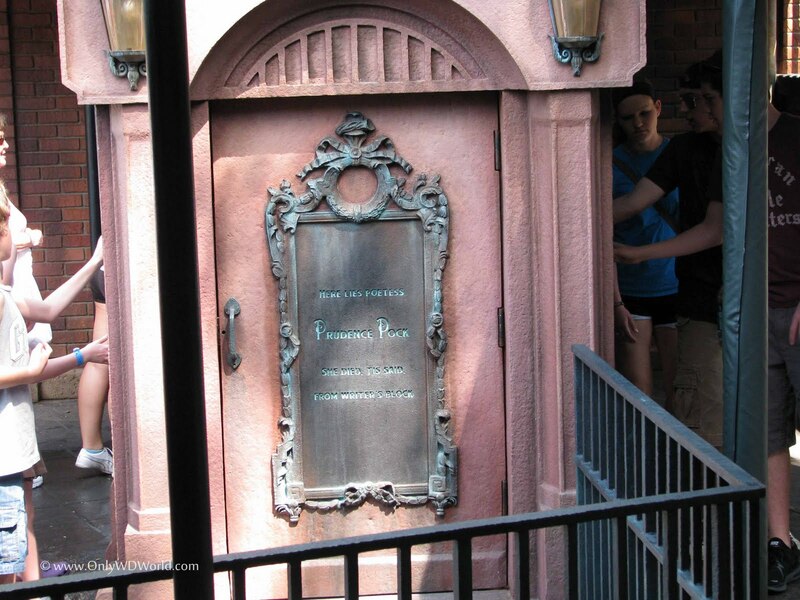 We are also glad that the original tombstones were preserved and integrated into the new queue. 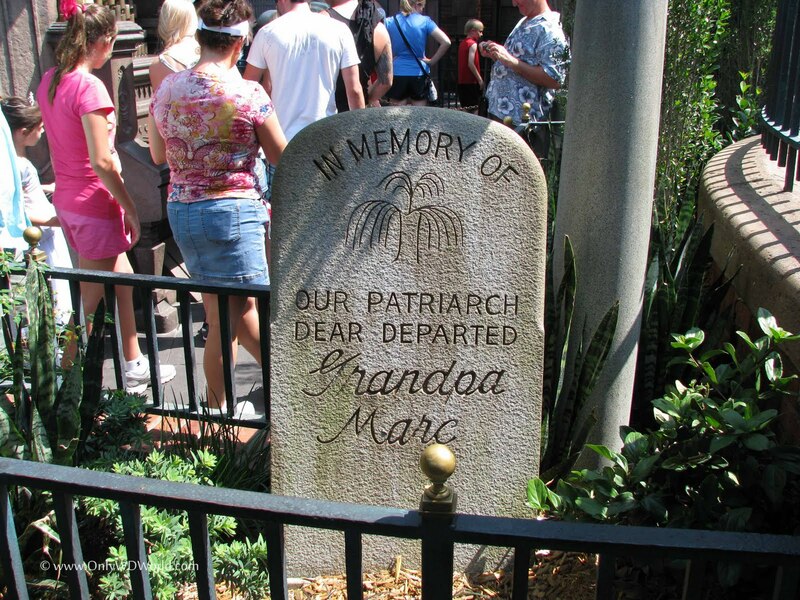 We are especially glad since they pay tribute to the people that designed and built the Haunted Mansion. 3 comments to "New Haunted Mansion Queue At Magic Kingdom Is Scary Fun"
Got to give a big round of applause to the guys in Imagineering. Disney World simply the best place created for families to bond. Both children and parents have a thing to enjoy for themselves, I couldn't agree more when people say it's a magical place. Awesome! Disney World has been always the friendliest place and most enjoyable to bond with family, friends, or even your love ones. So, this New Haunted Mansion is our next destination huh...see you there. I was not really surprised because Disney World really has a bunch of creative and imaginative people. They keep on amazing and entertaining people. They're marvelous!